“Finnegan is not an ‘eat what you kill’ firm,” explains Jean Fordis. “All clients are considered firm clients. That said, it’s still very important to generate business. 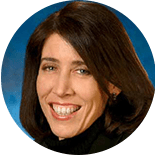 We encourage our attorneys to develop a niche for themselves, and to broaden relationships with current clients as well as the clients that other partners might have brought in.” Fordis’ two-pronged patent transaction and strategic counseling practice is rooted in areas that have been of interest to her since the early years of her legal career. Much of her work consists of helping to build portfolios for small, startup biotech companies located in California’s Silicon Valley. Because their IP departments are nonexistent or very small, Fordis essentially works in-house for the fledging corporations. Early in her legal career, Jennifer Hernandez was counseled against using humor in the workplace. She was advised to cut her long hair and not to use a computer at her desk because she might be mistaken for a secretary. Hernandez chose to disregard these and other well-intentioned suggestions, and instead drew up her very own map to success. “From the day you start practicing law you’re engaged in professional development activities,” explains Hernandez, a Stanford Law School grad who today—long hair and sense of humor still intact—heads a 20-person practice group at Holland & Knight. 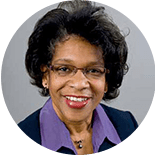 Her approach to generating work (which she has successfully applied to herself and many of the attorneys with whom she works) involves writing, teaching, nonprofit board experience, and responsiveness to clients. 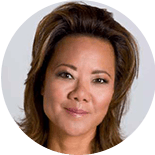 Given commitment and barring economic downturns, attests Hernandez, her formula typically results in a book of one million dollars plus in eight to ten years. 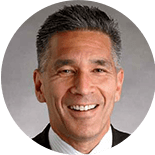 “First, I put the potential client at ease,” explains Gary Lafayette, litigating partner of Lafayette & Kumagai LLP. “Then I present our track record—that’s important for an 11-person firm. We’ve argued at the [U.S.] Supreme Court, handled and defeated motions for class certification. We’ve tried difficult cases and prevailed. 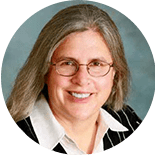 It’s important that clients understand the value that my firm and I bring to resolving problems.” A graduate of the University of California, Berkeley, School of Law, Lafayette spent five years as a litigator at Pettit & Martin. 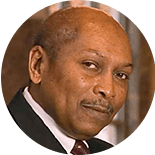 In 1985, he joined minority-owned Alexander, Millner & McGee (which became McGee, Lafayette, Willis and Greene, and then Arnelle, Hastie, McGee, Willis & Greene), and then in 1994, established his current litigation firm. Throughout his career, he has strived to maintain a nice book of portable business. Without it, Lafayette says, he feels vulnerable. 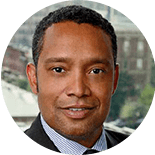 Long before he decided to pursue a career in law, Karl Racine felt inspired by the historic work performed by Charles Hamilton Houston, Thurgood Marshall, Constance Baker Motley, William Hastie, and other African American lawyers. At the same time, he was also aware that he possessed a certain contrariness that made the prospect of becoming a professional advocate very attractive to him. 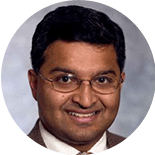 After taking a trial advocacy course from Judge James R. Spencer (E.D., VA), at the University of Virginia School of Law, Racine knew for sure that he wanted to be a trial lawyer. 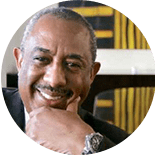 Born in Haiti, Racine has lived most of his life in Washington, D.C. Today, as the only African American Managing Partner of an AmLaw 100 firm, he concentrates his efforts on understanding the opportunities and challenges that confront the firm’s clients. Racine strives to ensure that every client’s needs are met and excellent service is provided. 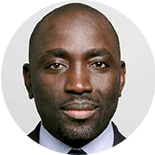 Born and educated mostly in London, England, Sokenu first came to the United States to earn an LL.M in securities and financial regulation at Georgetown University Law Center, after which he joined the SEC’s Enforcement Division. 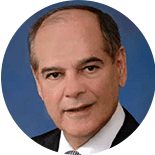 Undaunted by not having the luxury of an extensive network of stateside college and law school classmates, he quickly set about making himself known by regularly writing and speaking about his practice areas—securities litigation and enforcement and white collar criminal defense. Today, Sokenu continues to represent multinational companies in major financial and securities law matters, including Avon Products, Inc. in an FCPA internal investigation and Ernst & Young Global Limited in Madoff related litigation, among others. 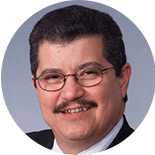 Unlike many of his Mexican American peers growing up in West Texas, Robert L. Soza Jr. was never discouraged from speaking Spanish at home. In fact, his college educated parents not only encouraged him to remain fluent in his first language, but they urged him to explore his Hispanic cultural identity as well. Those decisions eventually paid off in ways he could not have anticipated. After earning his J.D. from the University of Texas, Soza focused on environmental law and customs, but with the passage of NAFTA, everything changed. “Speaking Spanish became an invaluable asset,” he says. 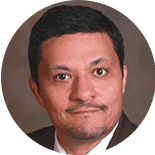 “I began working with U.S. companies in Latin America and Spanish-speaking foreign nationals doing business here.” Soza says nurturing existing relationships is his strength. 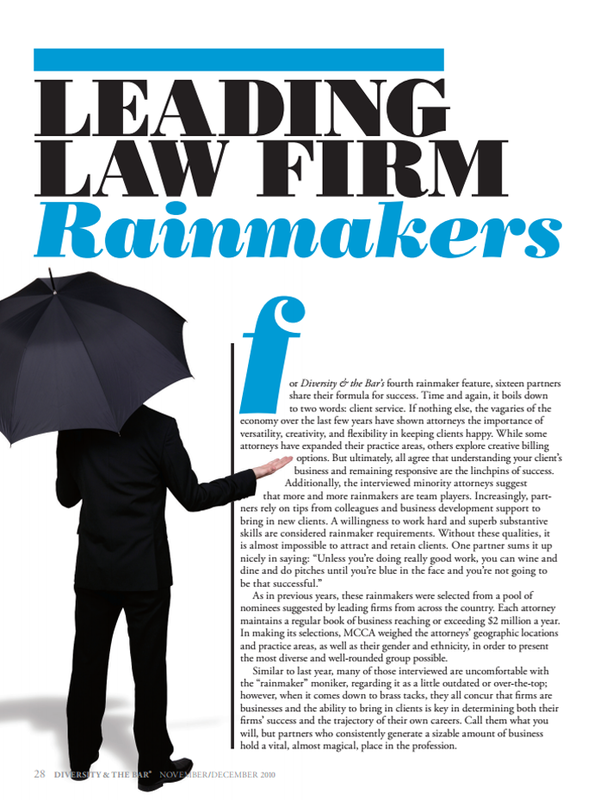 “Some rainmakers excel at going out and forging a constellation of new relationships,” he says. “That’s not my skill set. In one year I’ll generate a lot of business, but it will typically come from four or five clients. “I tend to concentrate on clients with whom I feel that I can develop a lasting relationship. If I’m hired by a client for some matter, I’ll do what it takes to get to know them better. Whether that means visiting them on our dime, or attending a rank and file employee training to get to know their product better, I’m willing to put in the time.” Soza’s game plan is to continue working with colleagues and clients that he knows well and respects. For him, lasting relationships and rainmaking go hand-in-hand. 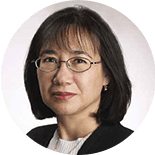 “I truly lucked out with immigration law,” says Margaret Wong, principle partner of Margaret W. Wong and Associates. 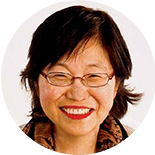 “Because I’m an immigrant myself, I’ve always been especially passionate about my practice area, and over the years have become very good at it.” Wong arrived in the U.S. from Hong Kong in 1969 on a student visa. 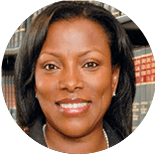 After putting herself through college at Western Illinois University and then the University at Buffalo Law School by waiting tables, she became one of the first non-U.S. citizens licensed to practice law in New York and Ohio. In time, Wong became a citizen and put out her own shingle. Today, she has offices in Cleveland and Columbus, Ohio; and in Detroit, Michigan.